I have always loved listening to audiobooks, and my own collection contains quite an eclectic mix, including The Iliad, Harry Potter and a spellbinding edition of Dickens’ Hard Times, which we used to play over and over again on the long journey from Rome to Greece on our annual family holiday. 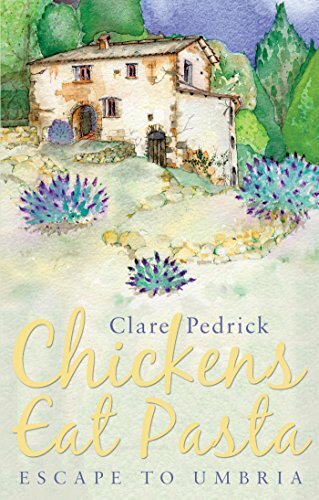 So when Colleen MacMahon suggested doing an audio version of my own book, Chickens Eat Pasta, I immediately agreed. I should explain that Colleen has been involved in my book from the outset. She was the first person I showed the proofs to, as she is an award-winning author in her own right. And since she is also a very accomplished artist, I asked her to paint the cover, which is actually adapted from a gorgeous watercolour that she did for me when she first came to visit my house in Umbria. This old house is the setting for the book, which tells the story of how I bought the property as a ruin when I was 26-years-old, and all the adventures that I had along the way, including the love story with a man I met in the remote hill village that became my new home. Colleen’s idea was actually for me to narrate the book, but it was obvious to me that she was the right person to take on the job, since one of her many talents is that of an actress. I was thrilled when she accepted, not least as it was a symbolic moment in a wonderful friendship that had started when we used to sit next to each other as schoolgirls, taking it in turn to write a stanza of a never-ending epic poem in our jotters, when we should have been listening to the Maths teacher. That budding literary partnership came to a sad and sudden end when Colleen moved away to drama school. We reconnected a few years ago, via Friends Reunited, and more or less took up where we had left off, so doing the audiobook together has been a very enjoyable experience, though it has also involved a great deal of hard work, especially for Colleen. We chose to publish the audiobook on Audible, which is part of Amazon, and is quite an easy-to-use platform, which enables authors and narrators to hook up, if they don’t already have someone in mind as we did. As an author, you can ask for auditions from prospective narrators, and also agree on a payment system, either offering a one-off fee or splitting the royalties, though it comes as no surprise that Audible creams off the lion’s share. I was lucky in that Colleen’s partner, who is a musician and very competent in technical matters, handled the production side, rigging up a professionally equipped studio space so that the end product would be really top quality. I know Colleen was concerned about pronouncing some of the Italian names and words in the book, but she needn’t have been, because with a little voice coaching from me – delivered by voicemail on WhatsApp which was quite effective – she has done a fantastic job. It probably helped that she speaks some Spanish, and also that she’s been out to my house in Umbria on a number of occasions, so she is familiar with the area, and has even met some of the characters, including the memorable Ercolino who in a sense steals the show in the book. I had been slightly nervous that he might not like the way I portrayed him, and it was with some trepidation that I took him a copy soon after the paperback was published. But luckily he was delighted and read the whole thing in two days, telephoning me when he had finished the last page to tell me how much he had enjoyed it. Very sadly he died a few weeks before the audiobook version came out, but I’m quite sure he would have approved of the way Colleen narrated him and all the other characters, and so it must be said, am I. If you like the sound of the book, you have the opportunity to win an audio copy of it by entering my giveaway. Click the link below to enter. You can enter up to midnight (BST) on Saturday 28th April and I’ll contact the winner within 24 hours. Remember you can leave reviews on Audible in the same way as you can leave reviews on Amazon/GoodReads etc. Authors love reviews so if you have read of listened to this book and enjoyed it, take a moment to leave a line or two to let other people know what you thought about the book. This looks right up my bookish street. Good luck everyone. Thank you for the opportunity.